By this action of the lateral canals the blood is made perpetually to pass and repass the respiratory sacculi; and, opposite to each of these, branches are given off which form so many independent vascular circles, representing very closely the minor or pulmonary circulation of higher animals. (583). On examining attentively one of the "respiratory pouches," according to the same authority, its membranous walls are seen to be covered with very fine vascular ramifications (fig. 109,f), derived from two sources: the latero-abdominal vessel (d) gives off a branch (e), which is distributed upon the respiratory sacculus; and there is another very nexuous vascular loop (6), derived from the lateral vessel itself (a), which terminates by ramifying upon the vesicle (f) in a similar manner. 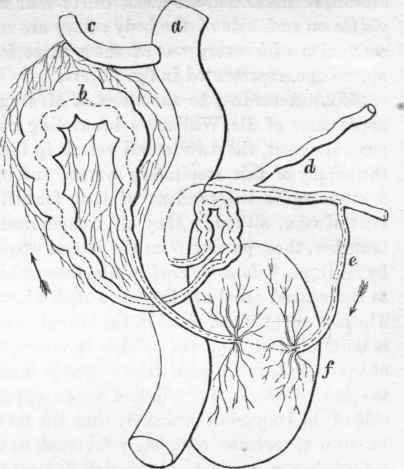 The walls of the loop (b) are extremely thick and highly irritable; but on tearing it across, the internal cavity or canal by which it is perforated is seen to be of comparatively small diameter; so that we are not surprised that, although such appendages to the respiratory sacs were detected and well delineated by former anatomists 1, their nature was unknown, and they were supposed to be glandular bodies appropriated to some undiscovered use. From the arrangement above described, M. Duges was led to believe that small circular currents of blood exist, which are independent, to a certain extent, of the general circulation, and that opposite to each membranous bag a portion of the fluid contained in the lateral vessel (a) is given off through the muscular tube (b) (which thus resembles a pulmonary heart), and, after being distributed over the walls of the supposed respiratory vesicle, and in this manner exposed to the influence of oxygen, the blood returns into the general circulation*. * Ann. des Sci. Nat. vol. xv. 1 Delle Chiaje, op. cit. Moquin-Tandon, Monographie sur la famille des Hiru-dinees. 4to, Montpellier, 1827. (584). The nervous system of the Leech (fig. 110, 7c) consists of a long series of minute ganglia joined by connecting filaments: of these, about twenty-four are situated along the ventral surface of the body. The anterior pair, or that immediately beneath the oesophagus, is larger than the rest, forming a minute heart-shaped mass, which is united, by a delicate nervous collar embracing the gullet, with two small nodules of neurine situated upon the dorsal aspect of the mouth. The two minute ganglia last mentioned form that portion of the nervous system most intimately connected with sensation; for, while the nervous filaments given off from the abdominal ganglia are distributed to the muscular integuments of the body, the nerves which issue from the supra-cesophageal pair supply the oral sucker, where the organs of the senses are situated. In all the Homogangliata, indeed, it is exclusively from this cephalic pair of ganglia that the nerves appropriated to the instruments of the senses are derived; and we shall therefore not hesitate in the following pages to apply to this part of the nervous system of the Articulata the name of brain; considering it to be strictly analogous, in function at least, with the cerebral masses of more highly organized beings. Fig. 109. Respiratory organs of the Leech, according to M. Duges: a, lateral vessel; b, pulmonary heart; c, dorso-lateral branch; d, latero-abdominal vessel; e, afferent pulmonary branch; f, respiratory sacculus. * As will be seen further on, the so-called "pulmonary hearts" of M. Duges are regarded by Dr. Williams as ovario-uterine organs. (585). The splanchnic system in the Leech consists of three small ganglia, situated in front of the brain, with which they are connected by delicate nervous filaments. All three send branches to the parts around the mouth and to the inferior surface of the alimentary apparatus*. (586). When, however, we regard the minute size of these as yet rudimentary nervous centres, we cannot expect to find them associated with any very perfect apparatus of sensation. The oral sucker, indeed, seems to possess a more delicate sense of touch than the rest of the body, adapting it to examine the surface to which it is about to be fixed; and probably the Leech may enjoy, in some measure, perceptions corresponding with those of taste and smell. These senses have been found to exist in many of the animals we have already described; but in the Hirudinidce we have, in addition, distinctly-formed organs of vision, exhibiting, it is true, the utmost simplicity of structure, but nevertheless corresponding, in the perfection of their development, with the condition of the cerebral masses in relation with them. (587). The eyes of the Leech are eight or ten in number, and are easily detected, by the assistance of a lens, under the form of a semicircular row of black points, situated above the mouth, upon the sucking surface of the oral disk, - a position evidently calculated to render them efficient agents in detecting the presence of food. The structure of these simple eyes, according to Professor Miiller1, does not as yet present any apparatus of transparent lenses adapted to collect or concentrate the rays of light; but each ocellus, or visual speck, would seem to be merely an expansion of the terminal extremity of a nerve derived immediately from the brain, spread out beneath a kind of cornea formed by the delicate and transparent cuticle: behind this is a layer of black pigment, to which the dark colour of each ocular point is due. (588). Leeches, like the generality of the Annelida, are hermaphrodite, every one possessing two complete systems of generative organs, one subservient to impregnation, the other to the production of the ova; nevertheless these animals are not self-impregnating, but the congress of two individuals is essential to fecundity.